Los Angeles grows pricier each year it seems, but at least there’s always solace to be found in our city’s excellent slate of economical eats. Housed in food halls and strip malls, prepared by dedicated and determined hands, here are this year’s most memorable dishes under 15 bucks. The latest offshoot from the Tsujita ramen family specializes in slurpable, bouncy noodles coated in a fiery sauce made from dried chiles and tongue-numbing sansho pepper. Select your heat level, and whether you’d prefer your noodles dry or in broth (we like dry), then prepare to feel the burn. Gilberto Cetina Jr.’s Yucatán seafood counter inside the Mercado La Paloma is a wonderland of oceanic goodies, but the crunchy tostada heaped with wild yellowtail and Santa Barbara sea urchin is the showstopper. Spoon on the habanero salsa if you’re feeling brave. 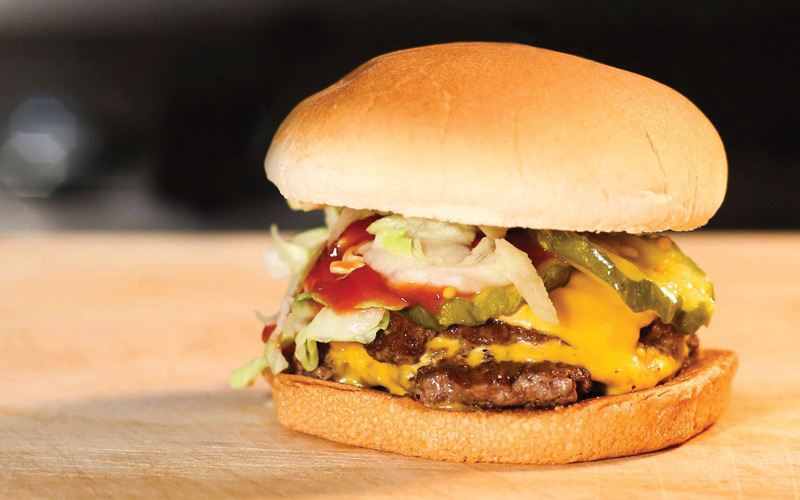 Santa Monica’s nostalgic burger joint keeps its namesake creation simple: two grass-fed Wagyu beef patties, American cheese, onion jam, sweet pickles, mustard, ketchup, and shredded lettuce. If the squishy bun recalls a certain red-and-white SoCal chain, that’s the point. Don’t miss those gorgeous hand-cut fries either. Jason Ha, the maestro behind Master Ha, slow simmers meaty ox bones as part of a two-day process to produce his signature sul lung tang, a soothing, savory broth seasoned table-side with green onions and sea salt. Snappy house-fermented kimchi rounds out the meal. At his tiny San Pedro storefront, sausage whisperer Humberto “Chori-Man” Raygoza sells from-scratch Mexican chorizo that’s among the best in L.A. Try the Tolucan-style green, flavored with cilantro and poblanos, rolled up with potatoes, eggs, and cheese in a two-fisted breakfast burrito. The owners of Sugarfish are behind this streamlined Italian concept, which highlights pasta imported from Bologna. The menu is bare bones, but the ability to duck in for a plate of excellent noodles, enhanced with crispy guanciale and zesty tomato sauce, all in the span of half an hour: truly game-changing. At his walk-up stand right off the Gold Line in East L.A., Max Henriquez (former executive chef of DTLA’s Horse Thief BBQ) glazes his crispy-outside, juicy-outside fried chicken with a sticky honey sauce. Order with a side of spicy slaw and watch the pieces disappear. Move over Yoshinoya—this recently-arrived Japanese chain offers towering rice bowls stacked with thin slices of beautifully rare roast beef, drizzled with sweet soy sauce and a slick of peppery yogurt. Add a raw Jidori egg yolk on top for $1; it’s highly advisable. Baker Jason Kaplan has amassed a cult following for his East Coast-inspired bagels: plump but not too plump, with a supple chew and thin crust. Seek out his smoked salmon bagel with cream cheese, red onion and capers at the Hollywood Farmer’s Market, or at his soon-to-open bagel shop in Silver Lake. Margarita Manzke’s Filipino food stall at Grand Central Market specializes in garlicky rice bowls topped with goodies like pickled chiles, fresh herbs and runny fried eggs. The one topped with a seared slices of house-made Spam—Manzke’s porky riff on a Pinoy pantry staple—might be our favorite. This was the year Josef Centeno finally went fast-casual, spinning off his popular downtown restaurant into a superb Culver City sandwich shop. It’s hard to order wrong, but the crispy chile shrimp “Bäcorrito” with cabbage, fresh mint, and tangy buttermilk dressing (served on stretchy cooked-to-order flatbread) is a must-try. Korean by way of Hawaii, these crunchy egg-battered slices of fried steak are paired with purple multigrain rice and potato-macaroni salad at Tim and Louise Lee’s island-inspired plate lunch spot in the Fashion District. Be sure to order a side of their spicy cucumber kimchi to complete a wildly flavorful spread. Serving up Lebanese cuisine with a Oaxacan twist, brothers Ignacio and Felipe Santiago are offering some of L.A.’s most interesting “fusion” food out of a take-out window in Boyle Heights. Try their creamy black bean hummus, the tabbouleh salad tricked out with diced nopales, and “chorizo kabob,” zesty links of grilled sausage that nod to the shared flavors of Mexico and the Middle East. Stuffed cabbage rolls peaked in popularity during the 1950s, but the Romanian-inspired sarmale at homey Highland Park dinette Parsnip make a good case for a comeback. Stubby pork-filled bundles are braised in tomato sauce until tender, then crowned with house-fermented sauerkraut and a thick dollop of sour cream. Started by three buddies—Arman Oganesyan, Tommy Rubenyan, and David Kopushyan—as a East Hollywood street food operation, Dave’s Hot Chicken evolved into a late-night destination this year, at least among those craving cayenne-coated chicken tenders packaged with creamy kale slaw, crinkle-cut fries and white bread (consider it L.A.’s homegrown riff on fast food chain Raising Cane’s). Look for their new brick-and-mortar near Western and Santa Monica to debut at the start of 2018. The morning-focused offspring of Chris Phelp’s popular Hollywood diner, Breakfast by Salt’s Cure serves some of the city’s best pancakes in a laid-back setting. Go for the ones studded with sautéed apples and sprinkled with spiced brown sugar. Roxana Jullapat and Daniel Mattern’s all-day café and bakery does comfort food well—hand pies, fried chicken sandwiches, egg salad—but it requires real culinary talent to make a bowl full healthy stuff sing. Loaded with brown rice, sprouted beans, avocado, pickled beets, sugar snap peas, cucumber, toasted seeds and a perky yuzu vinaigrette, Friend & Family’s Macro Bowl tastes way better than clean eating probably should.